Firefly: Out to the Black – review & giveaway! At last year’s Gathering of Friends game convention, as I was going from game to game & chatting with folks, I kept hearing about “this Firefly game”. I am at my very core a huge fan of Firefly & its resultant spin-offs, so I’m likely to want to get anything related to the intellectual property in front of me to check it out. 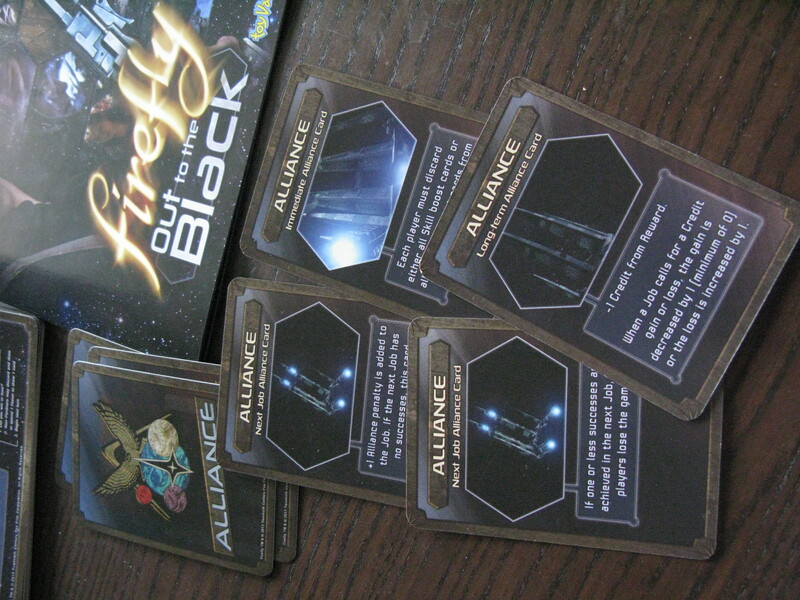 I finally got a chance to sit down with a few other people to try the prototype of Firefly: Out to the Black. You can read my initial thoughts here. Fast forward to earlier this year, and the game finally hit the shelves (due to a delay, I believe, in an unsuccessful attempt to Kickstart the game due to licensing, or some such thing). I am lucky enough to have a sweetie who keeps an eye on game releases fairly regularly, and he picked me up a copy from one of our local game stores so we could give the final, published game a shot. There hasn’t been much noticeably changed since the prototype we played – nothing major enough that it stands out to me, at any rate – probably just tidying up of gameplay/copy. 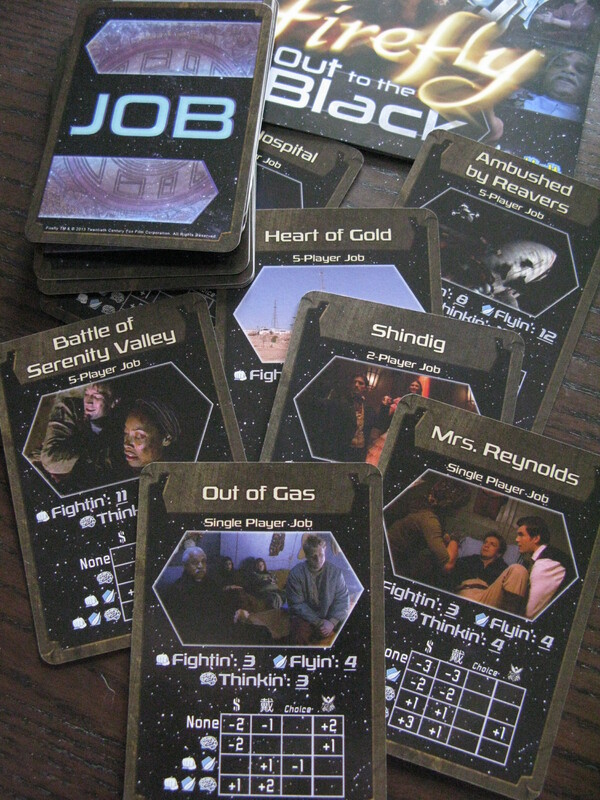 Firefly: Out to the Black is a cooperative card game for 3 – 5 players (recommended with 4 or 5). Play time is approximately 45 minutes. 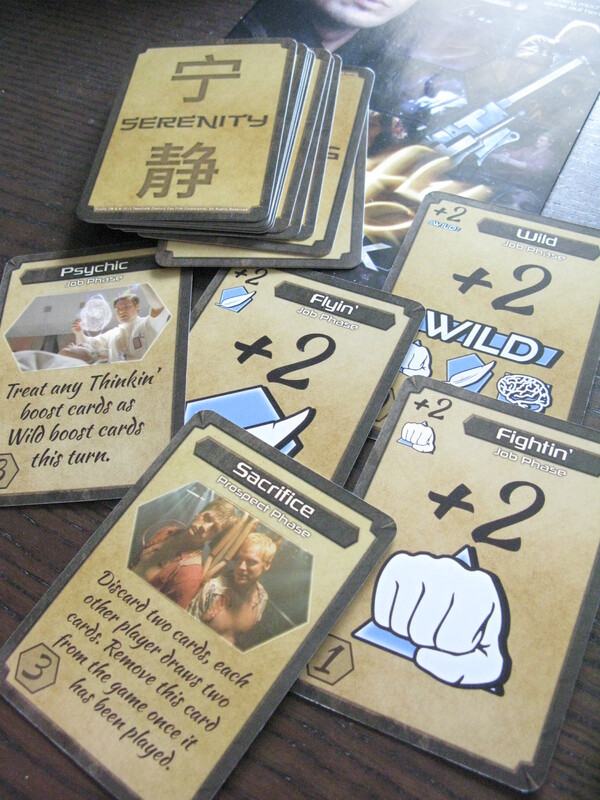 The premise of the game is that you’re a member of Serenity‘s crew, and you have to work your way through a number of jobs with your fellow players, successfully avoiding the Alliance and not losing too many credits or honour. From the very top down, this game is truly thematic – a cooperative struggle to do the job, get paid, make it through together. The art in the game is all promo shots & scene captures from the TV series, so it’s very familiar for fans but shouldn’t be offputting for people who are unfamiliar with the show. Each crew member has certain levels of skills (fightin’, flyin’ and thinkin’), which makes them better or worse at contributing when the crew is doing a job – this has been thought out fairly well (and each character has fairly low numbers as the crew must combine forces & play cards to reach each job’s goals. So, y’know – Kaylee’s strong with flying and thinking, whereas Jayne is pretty much all fighting, and Mal’s got a bit of everything. Thematically, it works really nicely; it also lets you pick a crew with a diverse spread of skills to ensure you cover all your bases. When a job is drawn from the deck, the start player (leader) will look at what the job requires skill-wise & pick the appropriate folks for the job. (To the job’s specs – the jobs can be solo or up to the full crew playing, and the leader that round must go.) There’s not a lot of flavour text with the jobs, but it’d be hard to get it on there with the rest of the necessary information: the skill level required, and the rewards/penalties for bombing/mostly succeeding/completely succeeding each job. I quite like this, as it’s not a black and white “succeed or don’t” outcome – it wasn’t really ever like that for the crew in the show, and honestly it was very rarely that they’d come through a job perfectly. So, if you’re not going to be getting through the jobs by the skin of the crew’s teeth alone, how do you do it? Serenity cards – almost all of these are relevant to jobs, and will add to skill checks and have other benefits. Each player starts with a handful at the start of the game – but there’s no regular draw phase throughout the game so you really have to be sparing with them There will be some other cards or character abilities that will let you draw extra cards during the game, but it’s tough to rely on that. Another way the game compensates for its cooperative nature with some tough choices and rarity of resources – plus, you can’t openly discuss what you’ll be contributing each round, so you need to be really savvy about how to talk about job tactics and playing these cards! A struggle, but not one that makes the game unenjoyable. But – of course – there’s more to a job than just that. 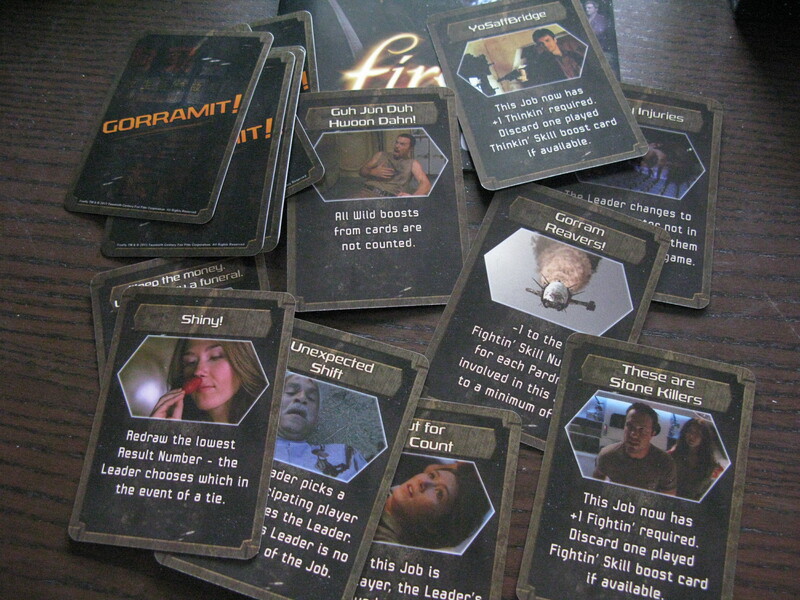 After the crew reveals their played Serenity cards for the job, a ‘Gorramit’ card is flipped over – these have all sorts of consequences. Making cards played not count, upping the skill required for the job, redrawing results, changing characters mid-stream and whatnot. Throwing a spanner in the works. This can often be pretty brutal, depending on how versatile your crew is, what cards you have available, and if you’re just scraping into the job enough that a change in required skills will mean failure. This will be a thorn that sticks in a lot of player’s sides due to the randomness of it – but I think it’s in the spirit of the game, and so far it’s not wrecked the gameplay experience for me. Luck is luck, in a card game, or our in the black. Alliance cards can come up as a penalty once the job is done, and either have a long-term or finite effect. These aren’t quite so tough as the Gorramit cards to run with – they usually have something to do with amending rewards/penalties for jobs, loss/card discarding conditions, losing credits/honour, shuffling a job back into the deck, and all the sorts of things the pesky Alliance would get in your way with, generally. While these are technically avoidable, they do pop up often, and can take a little tactical discussion to work with it so they don’t inhibit success entirely – depending on their effects. 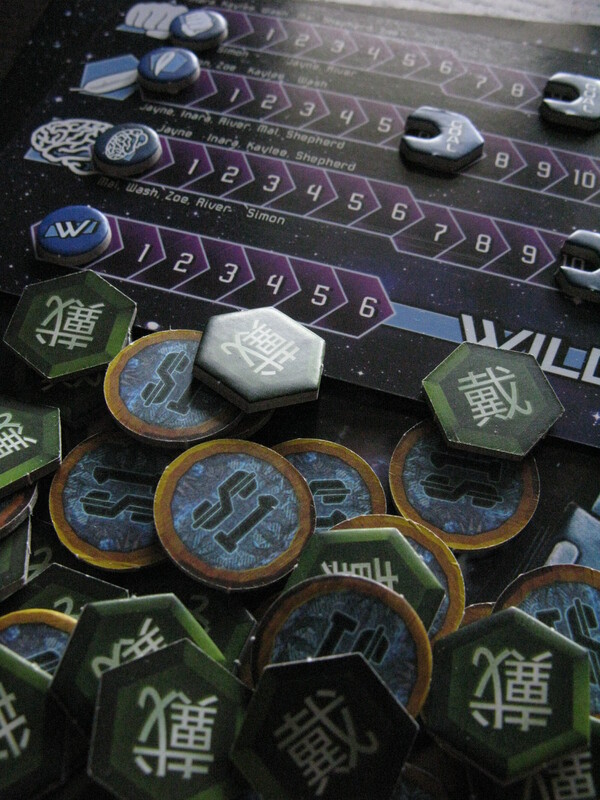 There’s not much else to the game other than the card playing, so there’s very few extras in the game – but I like the aesthetic of the tokens used to track skills in jobs, and the credit/honour tokens are nice, also. Other than the photos / captures from the show, there’s very little original art, and the design is fairly minimal – kinda spacey/sci-fi, but not overly. I think it all works fairly nicely together. I like that quotes or episode titles are used to give job cards and Gorramit cards at least a little flavour and reference for fans like me. My only gripe is the tone of the rulebook – much of the prose is written in a very slangy kind of way – I know there’s a bit of that in the show/movie, but I think it only serves to stand out here. A little of it is nice, I don’t want it to be devoid of personality, but all the dropping g’s and whatnot can really get tough to read over. Otherwise the rules are laid out well, and cover everything with some FAQs for cards in the back, too. There’s even a quick reference page (pity it’s not on the back cover of the rules). I still find the same fun and excitement in the cooperative nature of this, combined with the theme of a show I am very fond of to make a great package. I think this would be easy to learn for anyone who’s gamed before but might require a run-through for newbies to make sure they’re getting everything right (mostly with the specifics of order of phases, that would be the most important part to have down). If you’re into the show, it’d be worth it (and a much quicker play time than the other Firefly game that’s on the market – a full board game with lots going on). I think with the variety of characters, plus the amount of job cards in the deck (plus expansions already – which I have and look forward to trying! ), this would have a decent replay value, as well. Will folks who don’t know/like the show enjoy the game? Well, if you would be interested in playing a cooperative card game where a ragtag bunch of space folks are banding together to try and complete missions without failing and having “the man” catch up to them, then I think so, yeah! At this year’s Gathering of Friends convention, I caught up with Ed Bryan, the designer of the game. He gave me a copy of the game as a thank you for being one of the people who had sat down with him last year to play test the game in its mostly final stage. I’d been so excited to own the game when it came out that I have my own copy, plus the copy that Ed gifted me. It’s still in shrink, and brand new – and I’d like to make sure that it goes out into the world to someone who might appreciate it! I’ll keep this fairly simple, but please read the below carefully. 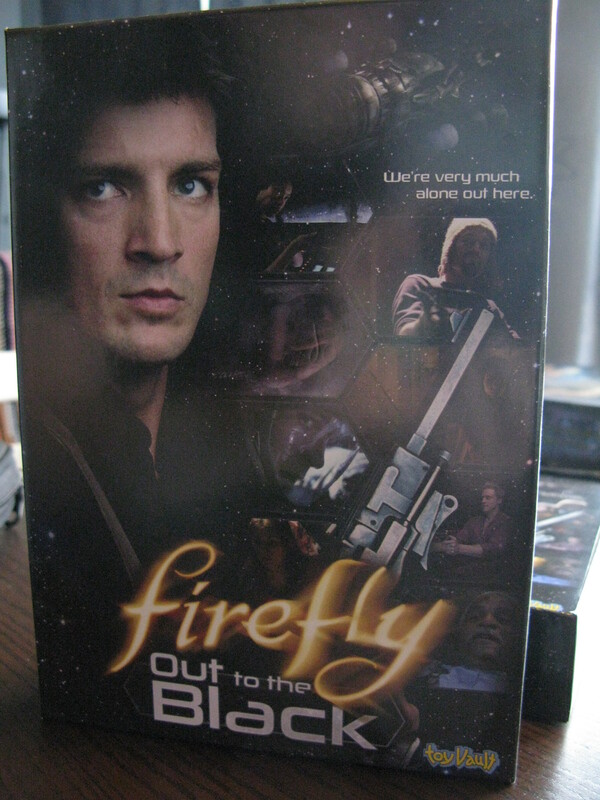 I have one (1) copy of Firefly: Out to the Black to give away, and I’ll post it out anywhere in the world. To enter to win, please comment (only once!) 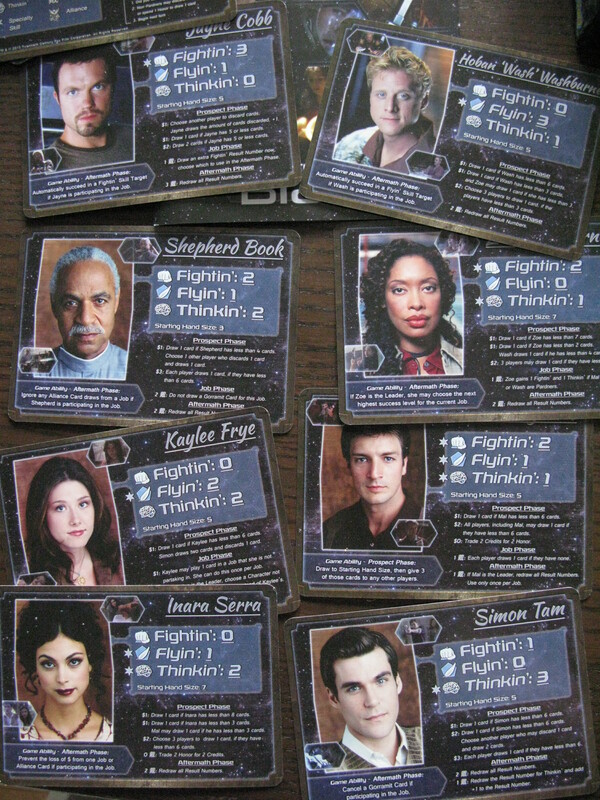 on this blog post telling me your favourite episode of Firefly, and who you would pick as your character to play in the game. At 11am EST (i.e. Toronto time) on July 23rd I’ll stop taking comments. I’ll assign each commenter a number, plug the numbers into a random generator to pick a winner and contact that winner to organize logistics of getting the game to you. Obviously I’m going about this casually, as it’s really just out of my own interest that I’m doing this giveaway. Any posting of the game will be at a surface rate, unless you’d like to chip in to have it get to you faster! Please don’t try to spam me with multiple entries, as it’s really not in the spirit of what I”m doing here. Thanks for reading, and taking part in the giveaway if you’re so inclined! Oh man are you really making me choose? Ok, Our Mrs. Reynolds, but runner-up is Trash because of Mal’s bum 😉 And I’d play as Kaylee. I think my favourite episode was “Our Mrs. Reynolds”. I enjoyed the humour of it and I found it an overall fun episode. As for whom to play? I’d go with Jayne. I just enjoy his character too much! So funny and so ready for violence. Loves it! Nice review. I flip flop on my favourite a lot. Today will be Jaynestown. So naturally my choice of character should be Jayne. This sounds like fun! My fave ep is Shindig. Because of the lovely dress Inara wears and the scenes between Mal and Inara. I definitely see myself as Kaylee (but not in the ruffle dress, haha). Congratulations, the random number generator chooses YOU! Out of Gas, without a doubt, the shiniest episode in the whole damn verse. Heck Wash’s ‘tash deserved a spin-off series of its own! Oh and I’d play as Saffron, because then I could also play as Bridget and Yolanda too! My favourite episode is Out Of Gas (though just by a whisker, there are many beloved episodes), and I would have to play Kaylee. “Trash!” Definitely my favorite. But, who to play…Wash probably. Curse your sudden but inevitable betrayal! Thanks to all that entered. I used a random number generator to pick the comment to win, which was number 4.